Peter Mark Such (born June 12, 1964 in Helensburgh, Dunbartonshire, Scotland) is an English cricketer. A hard-working county off-spinner, Such was brought into the Test arena in 1993 as a replacement for John Emburey but, despite taking 6 for 67 on debut, only played an initial four Tests before having to wait 5 years before his next appearance. Such enjoyed a 19 year first class career including stints at Nottinghamshire and Leicestershire before joining Essex in 1990. It was at Essex where he gained most success although he is perhaps best remembered for hitting the winning boundary in the second day of a Natwest Trophy semi final against Glamorgan in 1997 when play had been suspended the day before due to bad light with Mark Ilott and Robert Croft having an on field confrontation seen on BBC television. Although not noted for his batting, in 1999, playing in his final Test at Old Trafford, he made the second-longest duck in Test history, from 52 balls, against New Zealand, and earned a standing ovation. He is currently playing for the first team of Totteridge Millhillians in the Hertfordshire Division 1 and is also is a coach for the younger players. Peter is an ambassador of the Essex Playing Fields and we greatly appreciate the support he gives us. No hurdle in life is impossible to overcome… Chapter One I regained consciousness at the bottom of a 15-foot embankment in the driver’s seat of a wrecked car. Moments earlier I had been enjoying the drive to Airlie Beach in Queensland, Australia, looking forward to catching up with old friends one last time before returning home to England at the end of what had been the most amazing year of my life. How had I got here? Had I hit another car? Or lost control of mine? All these thoughts running through my mind distracted me from the fact that my arm was starting to hurt. I looked down and saw a severed arm lying across my lap. At first I was scared it was from a pedestrian or another car I had collided with. I did not even contemplate that it might be mine. In a state of panic, I turned to my passenger, Barry, for reassurance, but all he said was, “Don’t look down, it’s your arm.” I don’t know why but those words seemed to calm me. 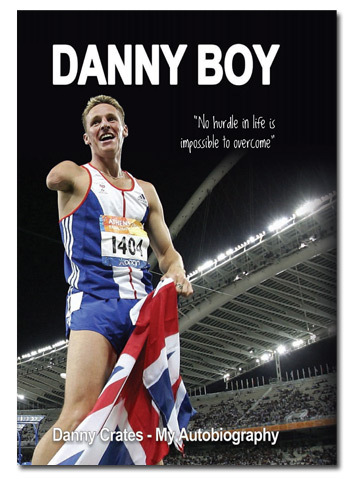 To read more of this great book, please log on to Danny's website dannycrates.co.uk where you can purchase a copy or go onto our online shop where you can buy a copy from us. Danny is kindly giving 25% of each sale that has come directly through us, to the Essex Playing Fields Association and for that, we are extremely grateful.